klm-aerocarto-1923. Aerial view of Markt square in Delft, photographed in 1923 during a late afternoon on a bright winter's day, as can be seen from the trees and the shadows. The camera is looking towards the south. Photo from the author's collection, also published in Exhibition Catalogue Vermeer & the Delft School. Copyright KLM Aerocarto, Arnhem. 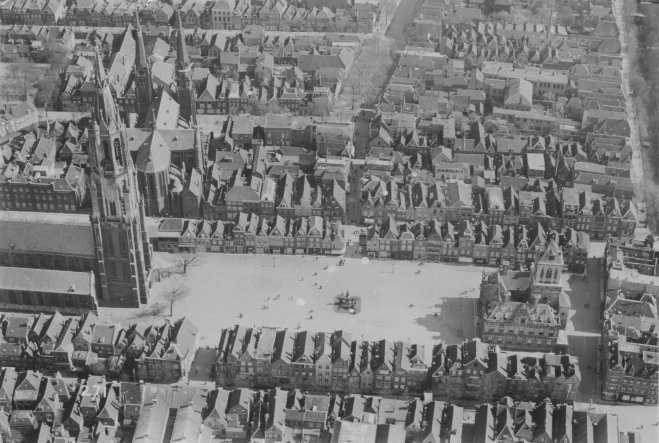 Aerial view of Markt square in Delft, photographed in 1923 during a late afternoon on a bright winter's day, as can be seen from the trees and the shadows. The camera is looking towards the south. Photo from the author's collection, also published in Exhibition Catalogue Vermeer & the Delft School. Copyright KLM Aerocarto, Arnhem. A version of this photo with annotations is seen here.